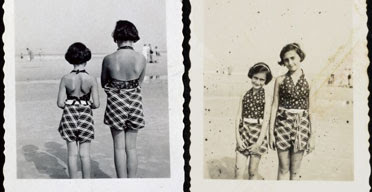 Two photographs of Anne Frank and her sister Margot (right) on the beach of Zandvoort, Netherlands, in 1937. The photograph on the right has only recently been discovered. Anne Frank's cousin gave up custody yesterday of thousands of letters, photographs and documents that archivists say will reveal details about the background of the teenage diarist who became a symbol of the Holocaust. Bernhard "Buddy" Elias, 82, had kept the materials for decades in his Swiss attic before permanently loaning them to the Anne Frank House - the museum incorporating the tiny apartment where the family hid during the Nazi occupation of the Netherlands - to mark the 60th anniversary yesterday of the first publication of The Diary of Anne Frank. The donation includes Otto Frank's 1945 letter informing his mother in Switzerland that his daughters Anne and Margot and his wife, Edith, died in Nazi concentration camps, the letter his mother wrote responding to diary excerpts that Otto sent her, and the recently discovered photograph of Anne and her older sister on the beach in 1937. With Mr Elias's collection, the Amsterdam museum holds nearly all known historical material about the family, including the postwar years when Otto Frank - the only survivor - compiled and promoted the diary. "This is a very moving moment for me," Mr Elias said, handing a thick inventory of the archive to the director of the Anne Frank House, Hans Westra. The 25,000 documents include material Otto gave to the foundation he started in Basel in his daughter's memory, and letters from Mr Elias's home there. Anne died of typhus in March 1945 in the Bergen-Belsen concentration camp at the age of 15, two weeks before the camp was liberated.